Stomach acid is important to the digestive system. It helps us process food and it kills harmful bacteria. The stomach makes the hormone called gastrin, which creates hydrochloric acid. When these acid levels increase, it can lead to hyperacidity. Excess stomach acid can range from mild to severe. Our diet, environment, and even stress can be contributing factors to excessive stomach acid. There are, in fact, relatively simple ways to reduce excess stomach acid or prevent it altogether. 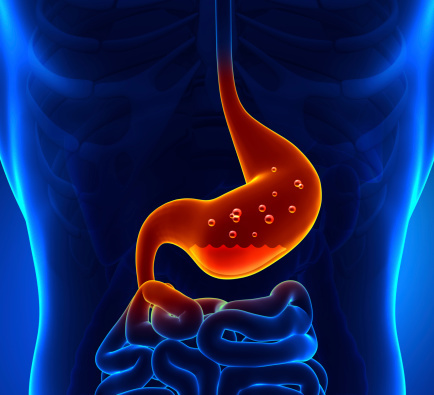 What causes too much stomach acid? Most people who experience excessive stomach acid symptoms complain about a burning sensation from the start. We’ll look at excess stomach acid symptoms in detail, but first, let’s consider what causes excessive stomach acid. Acid can build up in the stomach due to diet, excessive alcohol consumption, abnormally high acid production, or it can simply be hereditary. When excess stomach acid goes untreated, it can lead to ulcers. Diet plays a big role in controlling stomach acid too. There are certain foods that cause more acid and others that are better tolerated. Here’s a look at what causes excess stomach acid, starting with food. Citrus fruits: Oranges, lemons, limes, grapefruit, and pineapple can cause acid build-up. Apples, grapes, bananas, melon, and pear are much better options. Vegetables: Most vegetables fit into a low acid diet, but fried, canned, or creamed veggies should be avoided. Some people find that onions and tomato-based products bother them. Dairy products: Whole milk, high-fat creams, chocolate milk, and strongly flavored cheeses should be avoided. Low-fat and fat-free products are much safer. Grains: Any grains that are made with whole milk or cream. Meats: High-fat meats, cold cuts, chicken wings, sausage, bacon, poultry skin, and fried or greasy meats. Skinless chicken and lean beef are better choices. Spicy foods: Hot peppers, curry, garlic, and salsa are some examples. Fiber: Too much fiber can cause acid production to go into overdrive since it takes a long time for the food to pass through the stomach. Ulcers or cancers: Either of these can lead to an increase in the production of the hormone gastrin, which increases acid production. Stress: Research shows people who are severely stressed produce more acid in their stomachs. Infection: Bacterial infection by the bacterium H. pylori can also increase acid production. Irregular meals: Not having meals at a regular time or having long gaps between meals can result in acid accumulation. In most cases, symptoms of excess stomach acid can be attributed to diet. It can be helpful for people to keep a food journal, which enables them to pinpoint what food or foods are bothersome. Once certain culprits are identified, it is simply a matter of eliminating those foods from the diet to find relief. A feeling of discomfort in the middle to upper part of the stomach is called dyspepsia. It can include burning stomach pain, bloating, burping, nausea, and vomiting. Sometimes people with this combination of symptoms are suffering from stomach ulcers. Also referred to as acid reflux, it happens when the lower esophageal sphincter malfunctions. The sphincter is supposed to relax to allow food to pass through the esophagus into the stomach and then close to keep acids and food in the stomach, but if malfunctioning occurs, stomach acid can rise into the throat. Many people who suffer from ulcers complain about a feeling of indigestion or hunger. Ulcers are also called peptic ulcers. They are essentially a small hole or lesion in the lining of the stomach. Ulcers are caused by the destruction of cell tissues. Bloating, belching, and flatulence are common in people who are experiencing mild symptoms of excess stomach acid. However, these signs can occur just prior to acid reflux. Because stomach acid is actually corrosive, it is important to treat this symptom so that it does not damage the esophagus. If you are suffering and are trying to figure out how to reduce excess stomach acid, you will likely have luck with one of the following approaches. Some people do take antacids to help fight the symptoms, but it is important to know that chronic antacid use can cause side effects. This has a natural acidic component that is actually good for indigestion. The enzymes in the vinegar break down foods and help reduce acidity. Consuming apple cider vinegar before or after a meal is recommended. Keep in mind that it does not mean that you can eat unhealthy foods. Green juices can alkalize the body and reduce inflammation. They also stimulate gastric juices, which can help with digestion. Green juices are most effective when consumed about 30 minutes before mealtime. It is not advisable to drink it after a meal because it can disrupt the digestive process that has already started. A breakfast smoothie that is green can alkalize the body and is considered an easily digestible meal. Spinach, cucumber, berries, lemon juice, and unsweetened almond juice can be part of your breakfast smoothie. Raw salads and vegetables are naturally alkaline, so they can help with acidic stomachs. Heavily cooked vegetables can aggravate an overly acidic stomach. A tablespoon of olive oil helps coat the stomach and can help with heartburn and indigestion. You can also drizzle olive oil on your food. Consider that when olive oils are heated, they become more acidic. Raw or organic honey is a good option and much like olive oil, it can coat the stomach. Just a teaspoon or two is all you require. Honey can be consumed either pre-meal or post-meal. Consuming meals slowly and in a quiet, stress-free environment can prevent spikes in acid levels. This is a wonderful fruit to help decrease acid because it has a lot of potassium in it. There are also substances in bananas that help produce mucus that can protect the lining of the stomach. Saliva neutralizes acid and cloves promote the secretion of saliva. Cloves also promote good digestion of food. Regular consumption of ginger is known to help the digestive system. It can be beneficial when it comes to stomach ulcers since it creates mucus secretion, much like cloves. The leaves of the basil plant have carminative and soothe our digestive systems. They can be an effective relief from gas, nausea, and acidity. Although it is often suggested as a last resort, baking soda can also be an effective treatment for excessive stomach acid. One half to one full teaspoon of baking soda in an eight-ounce glass of water may help ease the burn of acid reflux. You can also drink baking soda by mixing half a teaspoon of it with a few drops of lemon juice and a half-cup of warm water. No, it is not the best tasting drink, but if you are in a lot of pain, it just might be worth a try. Most people experience the odd episode of excess acid in their stomach from time-to-time, which brings on symptoms such as acid reflux or mild heartburn. But when symptoms are occurring on a regular basis and you just can’t seem to pinpoint why, it is important to seek medical advice. Untreated heartburn, for instance, can lead to esophageal ulcers, esophageal scarring, or Barrett’s esophagus, which are precancerous changes in cells. About seven million people in the United States have acid reflux or what is commonly referred to as GERD.